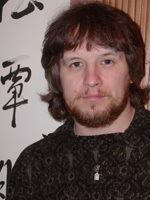 Vadim Smolensky has a background in computer science. He has worked in Japan as a researcher at the University of Aizu (Fukushima prefecture) for nine years. During this time he formulated his own mnemonic method of memorizing kanji in onyomi groups. His article, "Learning kanji through plot mnemonics", was submitted and published in "The Daily Yomiuri", 1995. This idea evolved into the long-term software project JiShop – a radical-based kanji dictionary, first presented at the International Conference on Computer Processing of Oriental Languages (Hong Kong, 1997). Vadim Smolensky is currently living in Liverpool, UK, where he continues to work on JiShop, a program designed to be the first stage in his mnemonic kanji memorization courseware. Vadim Smolensky has translated into Russian two novels by Haruki Murakami, "Hear the Wind Sing" and "Pinball 1973", published in Moscow in 2002. His own novel, "Notes of a Gaijin", was published in March, 2005. It is currently being translated into English. Copyright © 2005-2019, JiShop Software.